While searching for reference images I came across this site where the author had made custom cards from the 1981 season five episode of The Incredible Hulk entitled "The Phemon". David Bann ... err ... 'Bedecker' befriends a talented young (dimwitted) baseball player and ends up having to protect him from a corrupt manager. I had all but forgotten about the episode. If I've never mentioned it, I love The Incredible Hulk television series. I would have to say it's in my top four, along with Freaks and Geeks, The White Shadow, and Columbo. 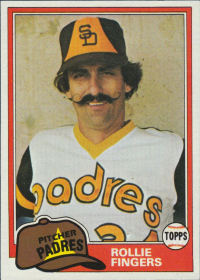 The author of the original post did his cards in the 1982 Topps style. I wanted to try them in the 1981 style since it is the year that the episode originally aired. I didn't want to use the exact same images, but despite extensive searching I could not find any better ones. 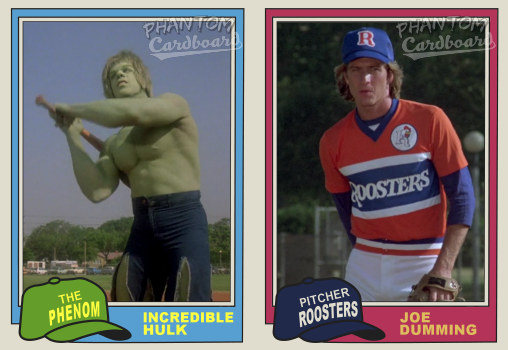 I love that the fictional baseball team was called the Roosters. That, and the Hulk swinging the lumber, are my favorite parts of these two cards. 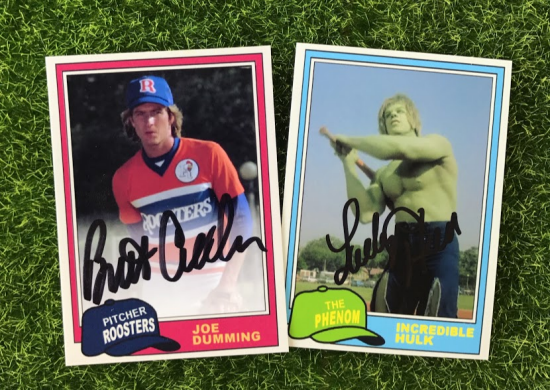 I got the Hulk card signed by Lou Ferrigno and this year's Motor City Comic Con and the Joe Dumming card signed by Brett Cullen through the mail.